Abstract. 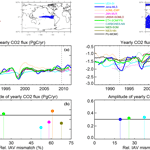 Using measurements of the surface-ocean CO2 partial pressure (pCO2) and 14 different pCO2 mapping methods recently collated by the Surface Ocean pCO2 Mapping intercomparison (SOCOM) initiative, variations in regional and global sea–air CO2 fluxes are investigated. Though the available mapping methods use widely different approaches, we find relatively consistent estimates of regional pCO2 seasonality, in line with previous estimates. In terms of interannual variability (IAV), all mapping methods estimate the largest variations to occur in the eastern equatorial Pacific. Despite considerable spread in the detailed variations, mapping methods that fit the data more closely also tend to agree more closely with each other in regional averages. Encouragingly, this includes mapping methods belonging to complementary types – taking variability either directly from the pCO2 data or indirectly from driver data via regression. 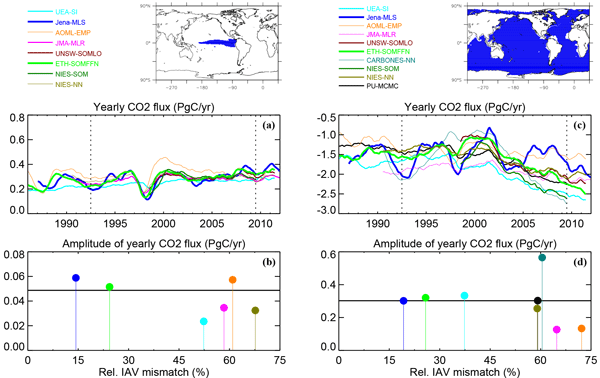 From a weighted ensemble average, we find an IAV amplitude of the global sea–air CO2 flux of 0.31 PgC yr−1 (standard deviation over 1992–2009), which is larger than simulated by biogeochemical process models. From a decadal perspective, the global ocean CO2 uptake is estimated to have gradually increased since about 2000, with little decadal change prior to that. The weighted mean net global ocean CO2 sink estimated by the SOCOM ensemble is −1.75 PgC yr−1 (1992–2009), consistent within uncertainties with estimates from ocean-interior carbon data or atmospheric oxygen trends. How to cite: Rödenbeck, C., Bakker, D. C. E., Gruber, N., Iida, Y., Jacobson, A. R., Jones, S., Landschützer, P., Metzl, N., Nakaoka, S., Olsen, A., Park, G.-H., Peylin, P., Rodgers, K. B., Sasse, T. P., Schuster, U., Shutler, J. D., Valsala, V., Wanninkhof, R., and Zeng, J.: Data-based estimates of the ocean carbon sink variability – first results of the Surface Ocean pCO2 Mapping intercomparison (SOCOM), Biogeosciences, 12, 7251-7278, https://doi.org/10.5194/bg-12-7251-2015, 2015.